Since professional dog grooming services can leave your beloved pooch’s fur looking vibrant and smart, unfortunately, these services can be a little bit expensive, and if you are trying to cut down costs or even if you want a more specified cut, then there is no reason why you cannot brandish the scissors yourself. It seems difficult, but it is actually quite doable. The easiest cut is what groomer’s refer to as a ‘puppy cut’. This is simply trimming your dog’s fur while keeping its natural shape. Mastering the skill of dog grooming takes time and practice. 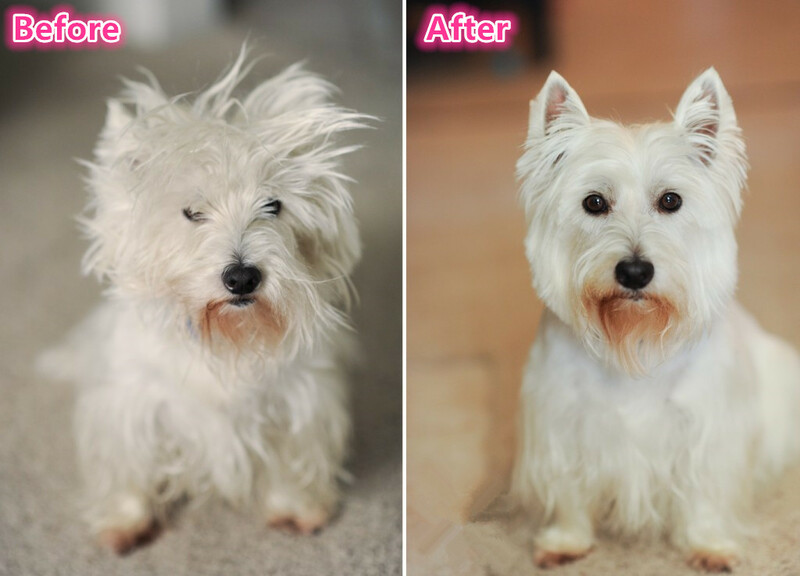 So do not be afraid of mistakes before you start to trim your dog’s fur, as your pet’s hair will eventually grow out and he will look fine. 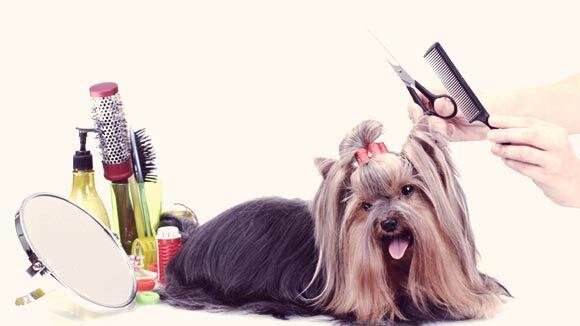 Have the dog supplies on hand: straight scissors, thinning scissors, brush and comb. Then let’s do it. 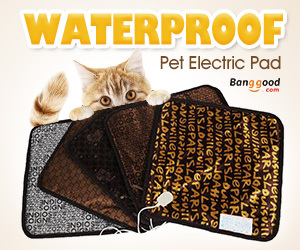 To begin with, your pet need a bath, then dry his hair in a good condition. Place your dog on a safe surface, since we do the hair cut at home, I also choose the ground as a ‘grooming table’ for my dog, better to prepare a trash next to you. Let him keep sitting or standing and comfort him by talking to your pet or touching his head, belly and so on. 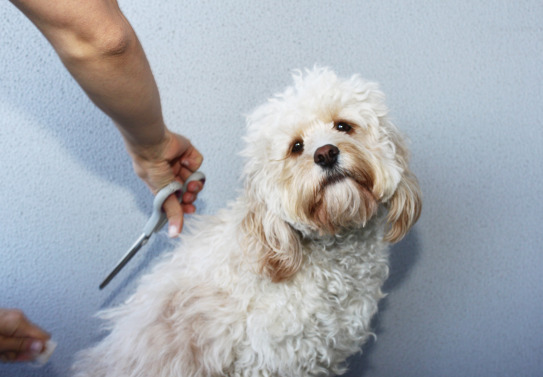 Brush your dog hair with a pin brush, pay close attention to areas that often contact the ground, such as his hind leg and under the tail, since they are susceptible to tangles and dirt build up. Use the straight scissors to remove any mats or tangles with pet needle grooming comb by holding the fur away from the skin and working from the end of the hair. Ensure you don’t pull or tug, which would cause your pup unnecessary pain. Grasp the shears or serration scissors in your hand. 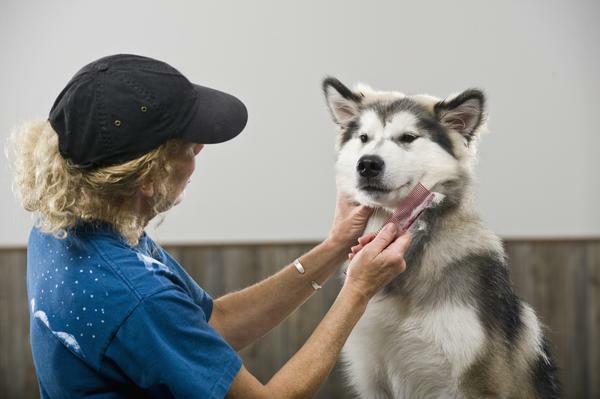 Hold the fur away from the skin and trim the end of the hair. At first, take off a small amount about 1/2 inches. You can always cut more later, it depends on how much hair your dog has. Then, cut the fur in the direction it grows. For instance, when cutting the legs, trim form the top of the hip toward the foot. 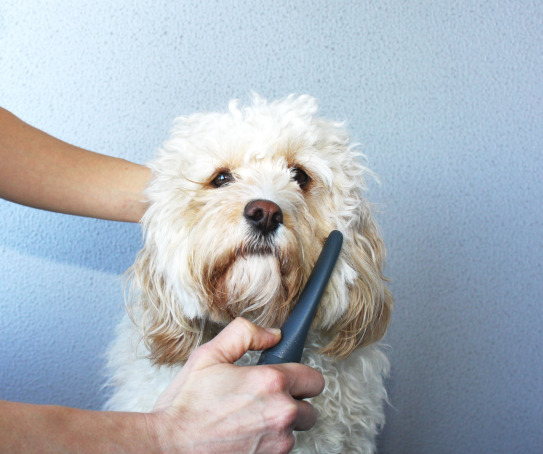 At last, trim around your dog’s face and eyes with blunt-end scissors. These scissors help protect you and your pup from getting cut. Also use these scissors to trim around his toes and foot pads.